All windows are custom manufactured to fit your home. Windows feature fusion-welded corners for extra strength. We offer triple pane replacement windows at dual pane prices. We meet and even exceed Energy Star ratings. We have options to fit any budget. The team at Columbus Windows and Siding listens carefully to what’s important to our customers, and then we deliver the most energy efficient replacement windows that will beautify and improve your home. Our outstanding product line, affordable prices, excellent warranties, and fast, easy installation is what set us apart from the competition. Quick consult to installation time! The best vinyl replacement windows are designed with multi-chambered main frames and sashes, and fusion welded corners that ensure strength and weather resistance. Wood windows are beautiful, but require extensive maintenance or they can rot. That’s why Columbus Windows and Siding offers wood composite windows that blend the luxurious feel of wood with the easy maintenance and longevity that comes with vinyl. You are probably living in a house with double hung windows. These are the most popular windows in the US. These types of windows have existed for many years. The windows feature a window sash on the top area and another one on the bottom area. These windows slide up and down when operated. The traditional operating mechanism of the window is a counter balance system that includes a cast iron weight, a rope and a pulley which connect the weight to the side of the window’s sash. To open the traditional window models, the top sash is dropped down by a few inches. This allows heat and humidity to exit the house via the top opening while a cooler breeze enters the house via the lower opening. This function made the windows to be used as an air conditioning system which can still be efficient today in saving your energy bills. Why Choose Double Hung Windows? 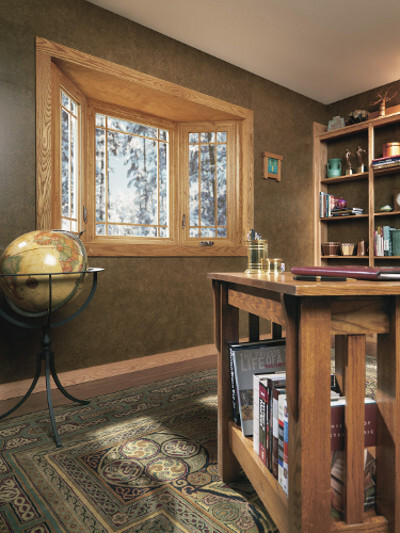 Today’s double hung windows have locks that are very easy to operate just with the thumb. The way the window sashes slide up and down makes it convenient for cleaning. The opening mechanism of these windows ensures maximum ventilation for your home. The windows are not only durable, affordable, but are also very beautiful. Enhanced security. Double hung windows can be safely locked from the inside and an intruder would have a difficult time to break them when they are shut. Safe design. Double hung windows are very safe than most windows because they don’t slide to the side or open outwards. This avoids the hazard of accidents in walkways, patios and other areas near the window frequented by people. Energy efficient. With double hung windows, homeowners don’t have to switch on their air conditioning systems in summer because the windows allow in enough air to cool the house which saves on electricity costs. Additionally, the windows also allow in good amount of natural lighting. Excellent ventilation. As earlier mentioned, double hung windows are great ventilators. The windows design controls air flow in and out of your house. When the top sash is open, warm air will leave a room while cool air will flow through the bottom sash when it’s opened. This will keep your home cool and fresh naturally. They look great. Probably one of the most admirable qualities of double hung windows is their elegant style that can improve the aesthetic look of your house. Their appeal makes them suitable for all kinds of homes or rooms. With these types of windows, you will have a limitless selection of sizes, finishes, styles and colors. Low maintenance. Many double hung designs feature tilt-out sashes that allow you to clean both the inner and outer panes while you are still inside a room. Other designs have removable sashes for easy cleaning. The other maintenance you have to do is to ensure that the movable parts are well lubricated. Double hung windows can fit all types of homes from traditional, contemporary to modern homes. Their excellent ventilation properties make them suitable for all rooms in your house like the living room, kitchen, bathroom and bedroom. Bay windows can be added in a home to open up a room. These windows allow in more light and give an illusion of bigger space. A bay window usually projects out of a structure’s wall into the exterior space unlike an ordinary window and is larger. The window structure consists of a large central window plus two smaller windows on either side. The picture or middle window is fixed and is usually installed parallel to the existing wall. The two smaller windows on the side are set at different angles which could be 30°, 45°, 60°, or 90°. These side windows could be either fixed or operating. Bay windows have an angular and flat structure that makes them fit in most modern homes. Bay windows are appropriate for window replacements for many rooms in your home. If you have large window openings for your ordinary windows, you can consider replacing them with bay windows. These types of windows allow in more light and expand a room’s space. Most homeowners consider bay windows because they can complement most architectural styles and therefore fit in both modern and contemporary home structures. Add a home’s resale value. Installing bay windows will increase your home’s curb appeal because of their stylish frames and shimmering glass. Since the windows extend outside the wall, they add some little dimension and create an appearance of added space in the interior of a room. The aesthetic appeal and volume added by these windows add value to a home during resale. Add more natural light in a room. Bay windows feature three panes at an angle that allow more light in a room. This will give you better views of the room and eliminates use of artificial lighting in the day thus saving on your energy bills. Create valuable living space. The little dimension added by bay windows make a room feels larger. The square footage created after adding these windows can practically be used. For instance, you can add plants on the window sill or station a bench in your little nook to enjoy the summer’s sunshine and panoramic views on the side of the window. Added ventilation. A fresh smelling house is always welcoming. Some types of bay windows feature two operating windows. This will allow you to enjoy a nice breeze from two directions rather than one. Versatility. Though bay windows are popular in most Victorian homes, they are also becoming a popular enhancement for most modern homes today. Boost views from indoors. If you have an impressive landscape or just enjoy watching the goings in your neighborhood, then bay windows will give you expansive views than ordinary windows. The large windows will give you and your guests an open environment with great views of the outdoors. Bay windows give you multiple options when it comes to their installation. You can opt to install a bay window in your kitchen, living room, music room or master bedroom. Since bay windows include a deep sill space, most home owners use them as a display for potted plants. If you are a homeowner and wish to add new windows in the existing large window openings, bay windows can be a great option. An experienced contractor in your area can professionally install the windows for you. Sliding windows also known as slider windows or sliders are constructed to open by sliding them horizontally along a track with rollers in the window frame. This simply means that the windows open side to side instead of double hung windows that open vertically or up and down. The windows feature one fixed or stationary pane and one sliding pane that opens vertically. Other designs could have dual or three sliding panes. These windows could be a great option for your lighting or ventilation needs. Sliders come in a variety of styles, colors, finishes and are made from different materials. Slider windows are suitable for both residential and commercial buildings. When it comes to residential windows, you will want something that is easy to operate, affordable and durable. Sliding windows can be used for replacing old windows or as an upgrading option when you are refurbishing your home. Slider windows are packaged with these advantages which make them common and many other benefits that are discussed below. Energy efficiency. Basically, slider windows have less moving parts which makes them to close tightly and prevent unwanted air infiltration. The windows’ superior construction includes panes with Zo-e-Shield glass which features non-conductive spacers that insulate against cold air infiltration and low-E coatings that insulate gas between the panes. These functions maintain right indoor temperatures in winter and summer times. Damaging UV rays are also blocked by the low E-coatings. The superior natural light allowance provided by sliders also eliminates the use of air conditioning system. All these features generally save on your energy costs. Easy operation. Slider windows are very easy to operate. They simply glide along the window frame effortlessly. You only need to release a latch and open them by sliding them along the track in the frame. The latch will lock in place when you slide the window to close it. Expansive view. Unlike double hung windows, sliding windows are larger and therefore allow great views of the outdoor scenery from side to side. Increase natural light. Sliders are large enough to allow entry of sunlight in a room and increase visibility. Use of bulbs in the day is thus eliminated. Low maintenance. Slider windows have few movable parts which mean less maintenance and effortless cleaning. The other thing you will have to do occasionally is to lubricate the small wheels in the window frame that the slider glides on and remove any debris or dirt that has accumulated over time. Space savers. Unlike most conventional windows that require some clearance to swing open, sliders will maintain their way in the track within the window frame. This is a very functional feature in places with narrow spaces. This also makes the windows much safer as they reduce the risk of accidents in high-traffic areas like in corridors and in decks. Sliding windows are uniquely made and their design allows them to be used virtually anywhere in homes and business buildings. The windows are suitable for kitchen, bathrooms and living rooms. Their horizontal opening style offers multiple advantages over their outward opening counterparts which is probably the most important feature that is making them more popular by the day. Casement windows are windows that are attached on their frames by one or more side-mounted hinges. These windows feature a pivot open mechanism and are closed vertically when an internal crank is rotated. Unlike other windows that incorporate a handle and are lifted up, casement windows simply crank outward. Casement windows are very easy to operate with a single hand thanks to their single-lever latches. These innovative windows are very affordable and stylish. Their versatile designs make them fit in many architectural styles. Whether you have a newly built structure or you are refurbishing your old house, casement windows will always be applicable. These windows can be suitable for hard-to-reach areas because they easily swing open with simple manipulation of the lever latch. Easy operation. Casement windows include an easy to operate single–lever latch and others feature automatic openers. Energy efficient windows. Casement windows are known to be energy-efficient because they feature a window sash that tightly presses against the frame when the window is closed. The tight seal created prevents cold air entry and warm air leakage from your home. Your heating and cooling systems will therefore not overwork to maintain the right temperatures of your house. This means reduced energy costs. Boost ventilation. Casement windows open outward from side-to-side and from top to bottom. In short, the entire window opens which allows in a natural breeze in a room and good amount of light. Versatile designs. Casement windows are available in a number of designs which includes pushout, flat top, Frenchtop down grille, prairie grill, colonial grill, and no grill. These windows can also be customized for desired size and are available in different colors. The materials used to make them range from steel, wood, vinyl, aluminum, and fiberglass. Better views. Casement windows have fewer or no muntins. Muntins are the strips of metal, wood, fiberglass or vinyl that divide glass panes on a single window. Muntins can block clear view of the outdoors. Casements with dual-sash have a single strip which is actually the window frame between the two sashes while single sash casements have no muntins, meaning enhanced outdoor views. Better security. Casement windows are very hard to break into. Additionally, the windows feature hook-shaped locks embedded within the frame for maximum security. Safety. In the event of an emergency situation that requires you to quickly move out of your house, casement windows allow for haste exit. The sash pivot makes the window to open widely which enables quick escape. Easy to maintain. Modern casement windows feature removable sashes that can be detached from the frame for easy cleaning. 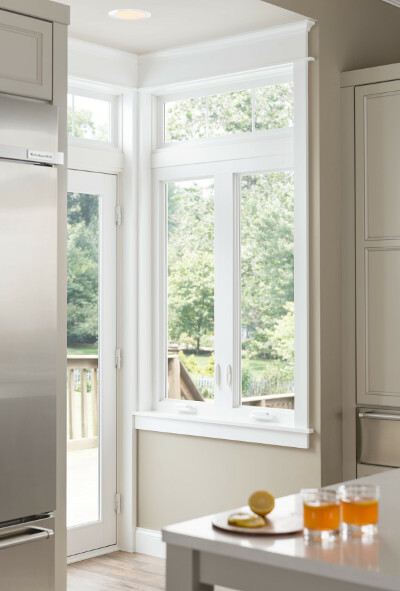 Casement windows are designed to open easily and are therefore perfect to install in areas with poor accessibility such as over countertops, kitchen sinks or appliances. Whether you choose to install casement windows or other designs in any of these areas, it is also good to know that they can be installed anywhere in the home. Picture windows are windows that are fixed, meaning that they can’t be opened or closed. Very often these will be particularly large, taking up entire walls in some cases, or being used in bay windows. These aren’t the most versatile or popular windows, but they do have amazing potential to lighten up a room and can be used to fantastic effect when combined with other types of windows, such as double hung, awning, or casement windows. The picture window is fixed, which right away introduces a number of advantages. With no mechanical elements, there is less to break, and therefore less maintenance and repair required. At the same time, the fact that the windows won’t open means security benefits. For those trying to keep others out of their home, and for parents trying to keep children in their home alike, they can be very useful. The large amount of glass in most picture window set-ups also has its advantages. It means first of all that you let in a lot of light, and that you can create a very attractive view or vista if you have a nice garden. They also help to heat up a property by letting a lot of light enter the premises. That said, all these benefits can also be downsides depending on the context. Such a large expanse of glass means it is hard to block light from entering, which can be a problem during very hot summer months. At the same time, the inability to open and close the windows means they can’t be used to let in more cool air. For these reasons, this type of window is best utilized in conjunction with other kinds. That’s where we come in. Awning windows are windows that have their hinge placed at the top and which open in an outward and upward motion as opposed to the usual horizontal opening found on most windows. This mechanism has numerous benefits and also makes for an interesting alternative to other window styles. For one, awning windows are ideal for opening when there is light rain. Whereas most windows will allow rain to blow in when they are open, awning windows will open up and create a shelter thereby preventing downward falling rain from entering the property. That said, a strong wind can still blow rain under the awning, so it’s not fool-proof. Another benefit of awning windows is that they can be used in locations where other window styles aren’t appropriate. For instance, if your window is next to a tree, then this could obstruct other opening mechanisms whereas the fact that the awning window opens directly upwards might allow it to move unhindered. Awning windows also have the advantage of being suitable for use on higher walls than some other window types. This in turn means they can be used in conjunction with those other windows in order to help improve ventilation. This can also be used to allow more light to enter the premises, while also leaving more of the lower wall available for furniture or hanging items. There are of course scenarios where this style of window is not appropriate. For instance, they are not suitable for high traffic external areas, as they open out further and can therefore obstruct a pathway. Another consideration is that they can become a target for bird droppings and other falling debris – meaning they will require frequent washing. As always, getting the most from your windows means consulting with an expert to find out which style is best suited to your specific requirements. In single hung windows, only the bottom sash is moveable, while the top sash is fixed in place. In most cases, these will open vertically (up and down) and will therefore not take up any space inside the room. The glass above the bottom portion of the window provides the space for this sash to move into. Single hung windows have a lot benefits, in particular revolving around security and energy efficiency. Single hung windows only open in the one direction, meaning that they have few moving parts, no hinges, and very few failure points. This ultimately makes them particularly secure and also minimizes the amount of repair and maintenance that is likely to be necessary. In terms of energy efficiency, the single hung window benefits from having a second inset sash. This provides a block against wind, while the simpler mechanism reduces the likelihood of efficiency deteriorating over time. Finally, as mentioned, these windows will not take up any interior space. This makes them a good choice for homes that don’t have a lot of external room to open into, as well as for owners who wish to decorate their shelves. Single hung windows do have the unfortunate association with older properties. These windows have been popular for a long time, which means the design is common in older homes with single glazing. This is why it’s important to choose a design and style that will complement your décor and look modern. It’s also why it’s important to ensure you buy a single hung window that uses the latest technology in order to provide optimum insulation and security. As with all window styles, you can combine the single hung window with other types in order to enjoy all the different benefits. 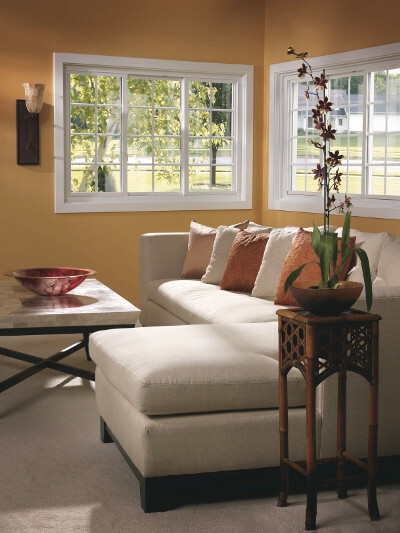 Our double hung replacement windows offer a sleek design and energy efficiency for those on a budget. These windows are designed for a lifetime of durable style. They remain our most popular replacement window. Triple pane replacement windows offer top of the line energy efficiency, condensation resistance and noise reduction. These windows are made with three panes of glass, not two, which take the energy savings to a whole new level. Multiple-chamber extrusion design for strength. Warm edge glass spacing system. Double or triple stacked low emission (Low E) glass. Argon or Krypton inert insulating glass (optional). Exterior polymer color finish (optional). Colonial and diamond grids (optional). These windows are, literally, built to last a lifetime. Our transferrable warranty covers the window components, as well as installation. We offer this coverage in all 90 U.S. markets we serve. The openings are prepared and the new windows are installed. Insulation is wrapped or injected around the window casing. The inside is trimmed and caulked. The outside is capped with aluminum coil stock in your color choice. All materials are hauled away and the job site is completely cleaned. Our teams install thousands of windows annually. All of our windows and workmanship are covered under warranty. Our customers choose Columbus Windows and siding because they know we have the best windows with the best warranties installed by the very best window installers in the business.